Discover the Native American and Dutch roots of the Great White Way, the first street in America to feature mass transit. It has gone by many names: the Wickquasgeck Trail, de Heere Straat, Bredeweg, and the Great White Way. 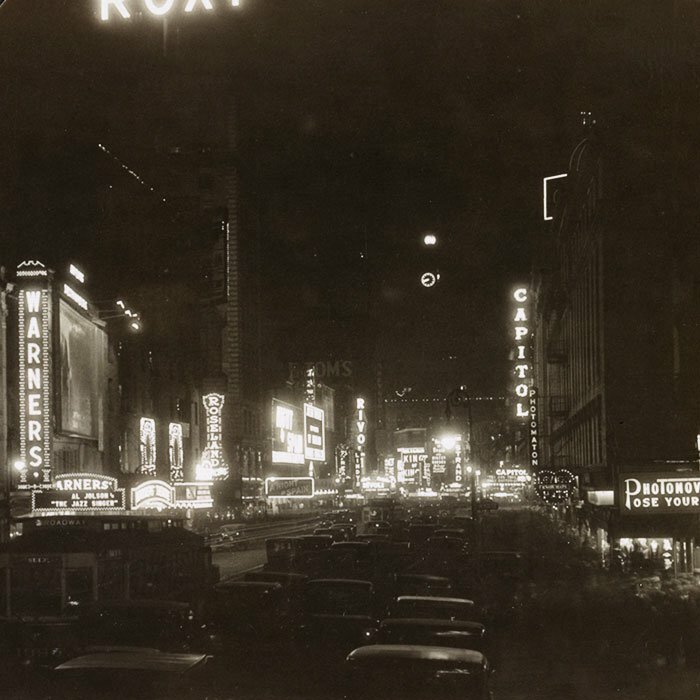 It has inspired songs and homages throughout the world, as just the sound of it conjures images of marquee lights, New York City ambitions, and the uniquely electric bustle of Manhattan’s most famous thoroughfare. That street is the singular, the indomitable Broadway. More than 400 years ago, the path that is today well trodden, paved over, and built upon was first carved out by early Native Americans. They used it to guide them through what was a swampy, rocky island along more stable, well-drained soil. The Wickquasgeck Trail, as it was known, was a reference to the Wickquasgeck people who lived in northern Manhattan and across today’s Harlem River. 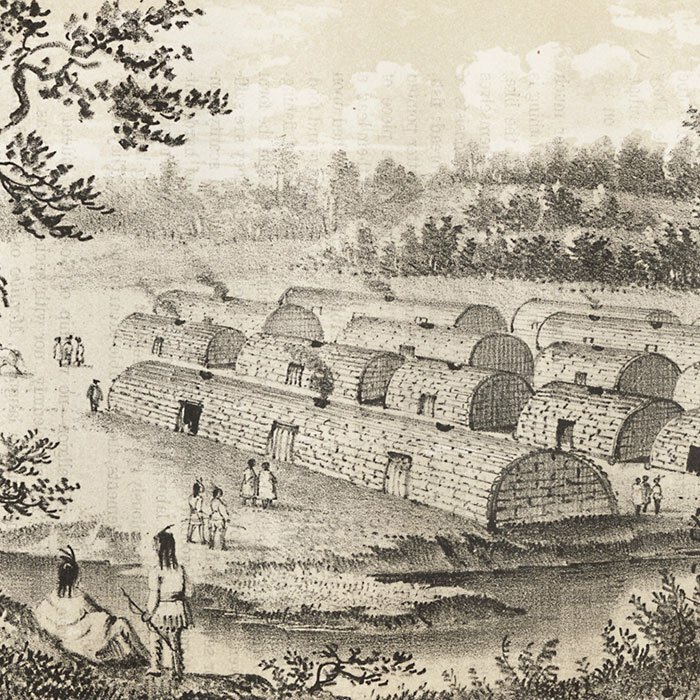 An Indian village of the Manhattans, prior to the occupation by the Dutch. Lithograph by George Hayward, published by D. T. Valentine‘s Manual, 1858. Courtesy of the New York Public Library Digital Collections. 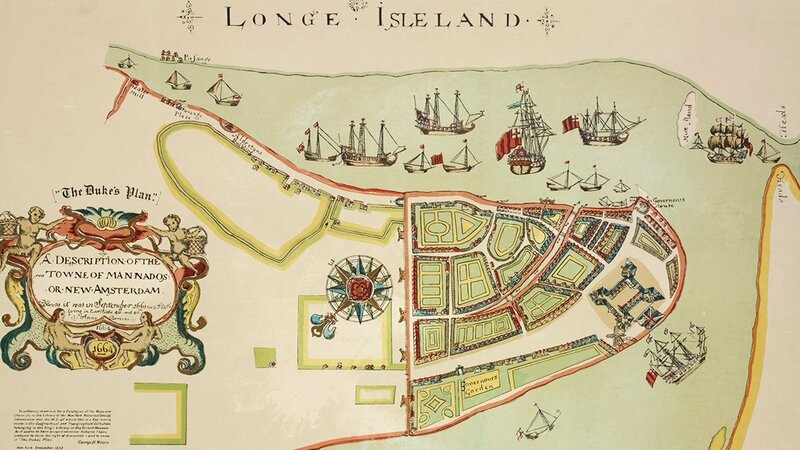 When the Dutch founded New Amsterdam on the southern tip of the island in 1625, they, too, made use of the path. They originally called it Heere Straat, or Gentlemen's Street, a name reminiscent of the great thoroughfares in the Netherlands where the elite would promenade in their finest attire. The Dutch eventually widened the road to make room for horse-drawn traffic, which earned it yet another name: Bredeweg, translated as Broad Way in English. 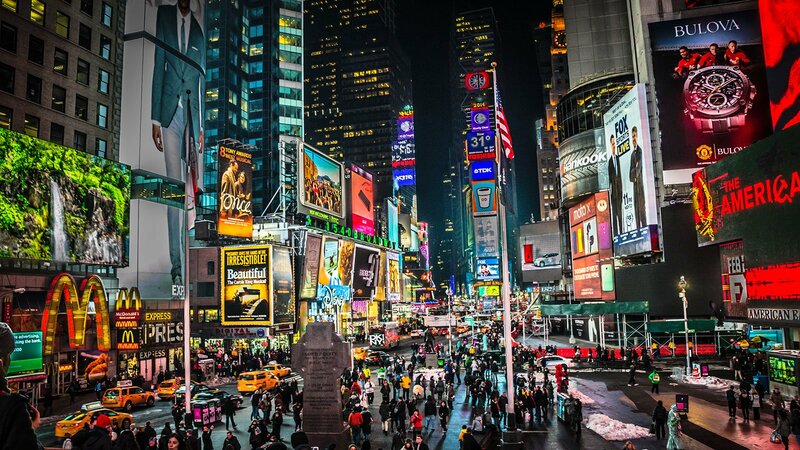 And so, after the British took control of New Amsterdam in 1664, renaming the island New York, the name Broadway became the preferred label. 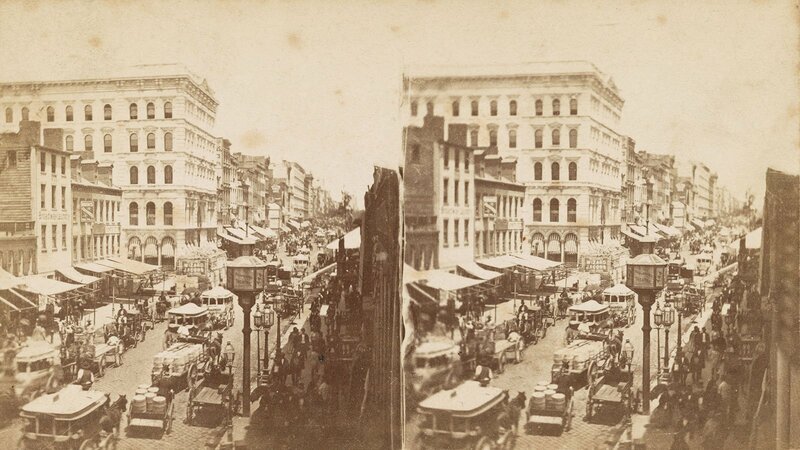 In time, traffic along Broadway increased until it became a bustling urban thoroughfare, filled with horses, carriages, ox carts, and a good amount of manure. In the early eighteenth century, a shrewd young businesswoman came up with a solution to lift pedestrians out of that filth. Polly Provoost, a widow who inherited her husband’s import business, procured large flat stones and had them laid in a path from what was likely Broadway to her store, just off the main drag. The “walking side,” as she called it, caused a sensation. Her business boomed, and soon other merchants and residents followed in her footsteps, constructing their own “walking sides,” later dubbed “sidewalks,” out of whatever was available – typically wooden planks, blue slate, and bricks – throughout Manhattan. Broadway became the center of colonial life, a place to gather, talk politics, and pass the time. On March 12, 1733, Bowling Green Park, New York’s first official park, was established along the street, just across from a tavern. It earned its name from its most unique feature: a lane for bowling. But it earned notoriety from an outburst of revolutionary fervor that occurred there decades later. 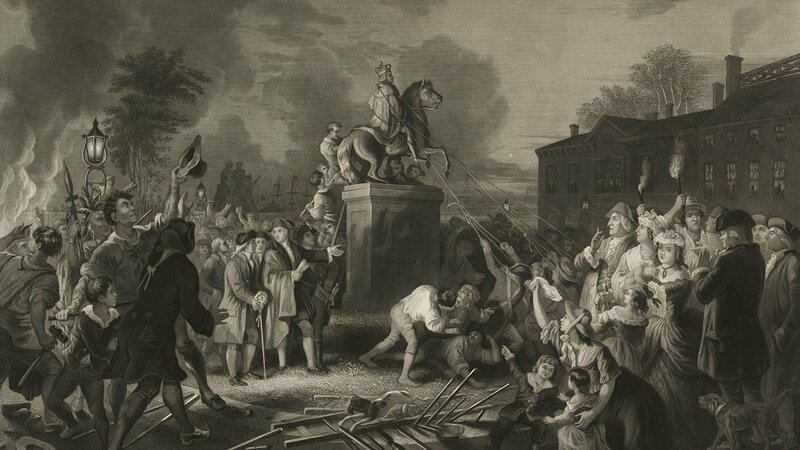 On July 9, 1776, the Declaration of Independence was read publicly at Bowling Green Park and it inspired the Sons of Freedom—composed of George Washington's soldiers and civilians—to tear down a large equestrian statue of the British monarch that then stood in the park’s center. In a rather poetic act of revenge, the statue was melted down to make musket balls for the Revolutionary War. Generations later, in 1827, Broadway made transportation history when it became the first street in the world to feature mass transit. The horse-drawn “omnibus,” as it was dubbed, was invented by Abraham Bower, a New York stagecoach operator and stable owner. Within eight years, New York had more than 100 omnibuses, some of them double-decker. Several other major American cities had also jumped on the bandwagon, building or purchasing their own. The invention transformed New York City, which to this day remains the American city with the highest mass-transit usage rate. And business boomed along the omnibus’s path. 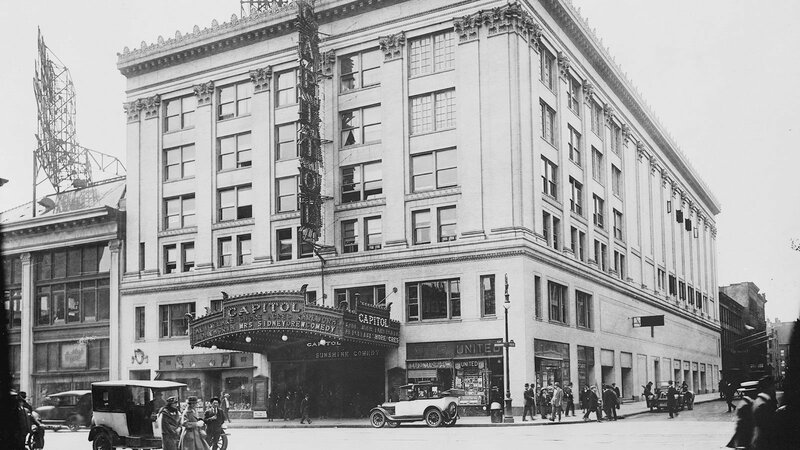 Broadway soon became the site of the country’s first department stores. In 1846, Alexander Turney Stewart built the “Marble Palace,” a colossal store with nineteen departments under one gigantic roof at 280 Broadway. Stewart cleverly marketed his goods to female customers through hosting fashion shows and advertising special sales. 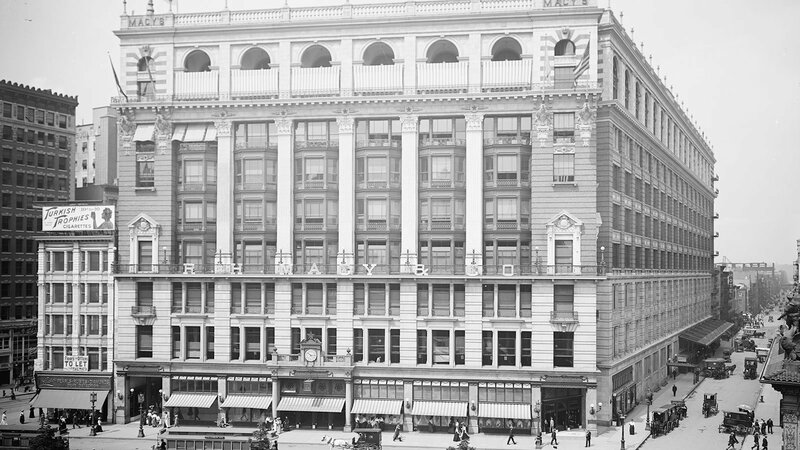 It wasn’t long before competitors such as Macy’s and Lord & Taylor arrived, creating a “Ladies’ Mile” along Broadway. 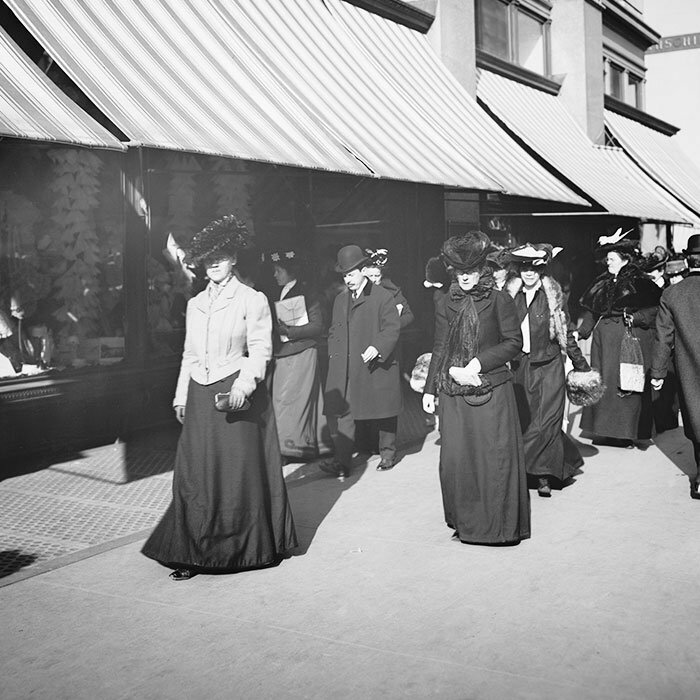 “It was one of the only places in the city where [women] could come unaccompanied, without a male chaperone, to window shop and take in the sights in their full Victorian dress,” explains Michelle Young, adjunct professor at the Columbia University Graduate School of Architecture, Planning and Preservation and founder of the online magazine Untapped Cities. Not only was it a wealthy, relatively safe neighborhood, she said, but shop owners went out of their way to make shopping pleasurable. “The service was impeccable. The merchandising inside the store was really beautiful. You would go in, and you would be waited on by staff,” said Young. The increased foot traffic and the coming of an elevated rail line enticed other businessmen, most notably theater owners, to build their own palaces of entertainment nearby. They used lights, then fueled by gas, to try to attract visitors. “It would have been very colorful,” said Young. She says theater owners would cut slits in the marquees and insert colored lenses to create colored lights. 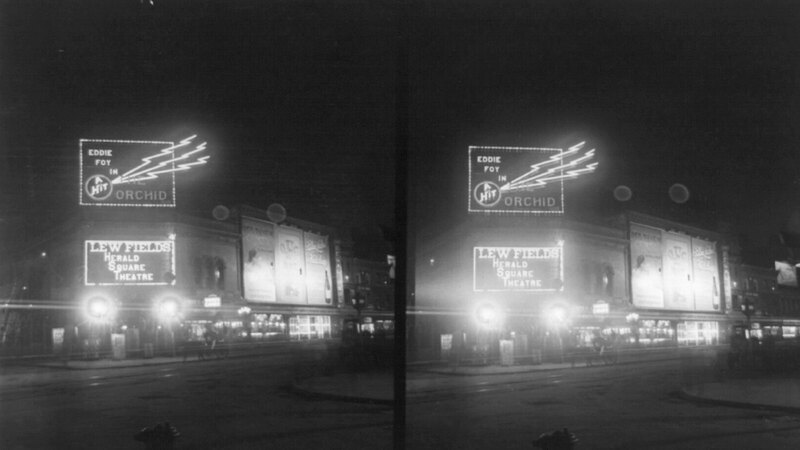 Meanwhile, the natural flicker of the gas lights created a flashing effect that is mimicked in marquee lights to this day. At the turn of the twentieth century, innovations in transportation made Broadway even easier to get to and travel along. The first electric trolley began operating on Broadway in 1901. The New York subway followed in 1904. 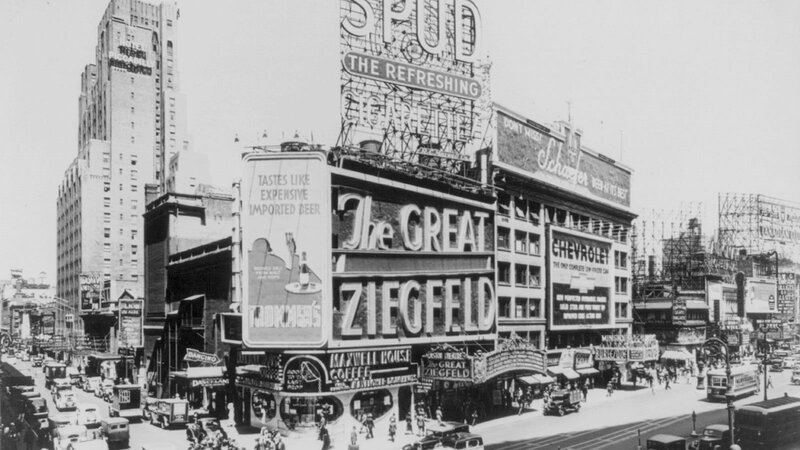 That same year, George M. Cohan made his Broadway debut, and Broadway solidified its place as the unrivaled entertainment capital of the United States. 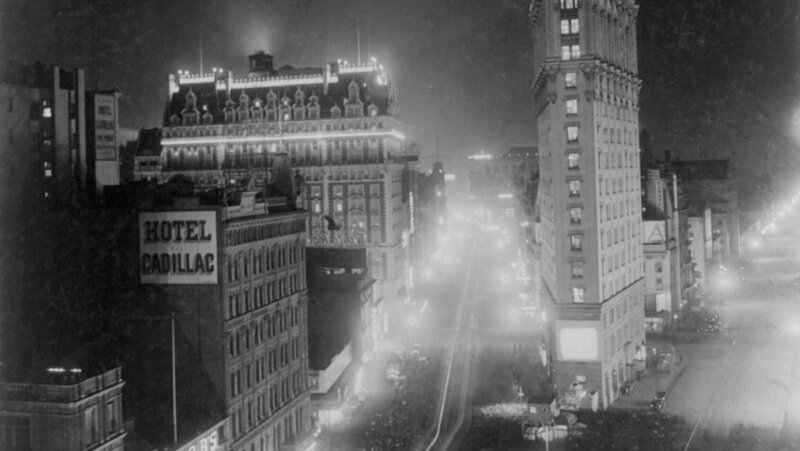 Also in 1904, the New York Times moved its headquarters onto Broadway, altering the name of the surrounding area from Longacre Square to Times Square. 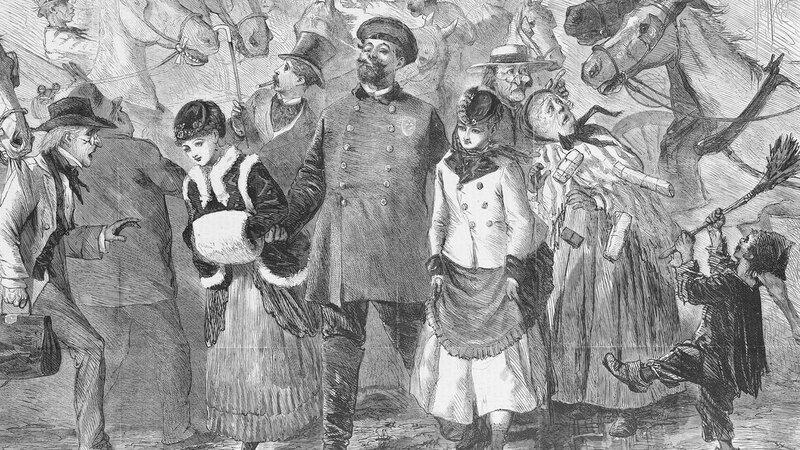 To welcome in their first New Year in their grandiose headquarters, paper owner Adolph Ochs hosted a public spectacle and lit off fireworks from the roof for a crowd of 200,000. 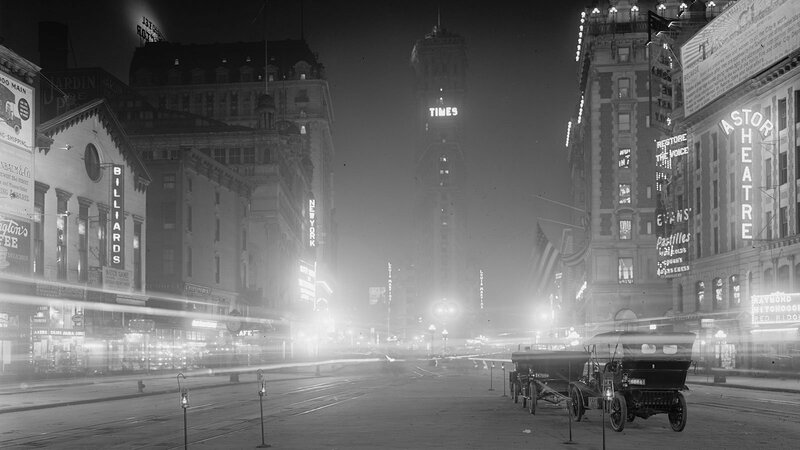 The public Times Square New Year’s Eve party has endured for more than a century. More recently, the thoroughfare that began as Wickquasgeck Trail has once again been redesigned. 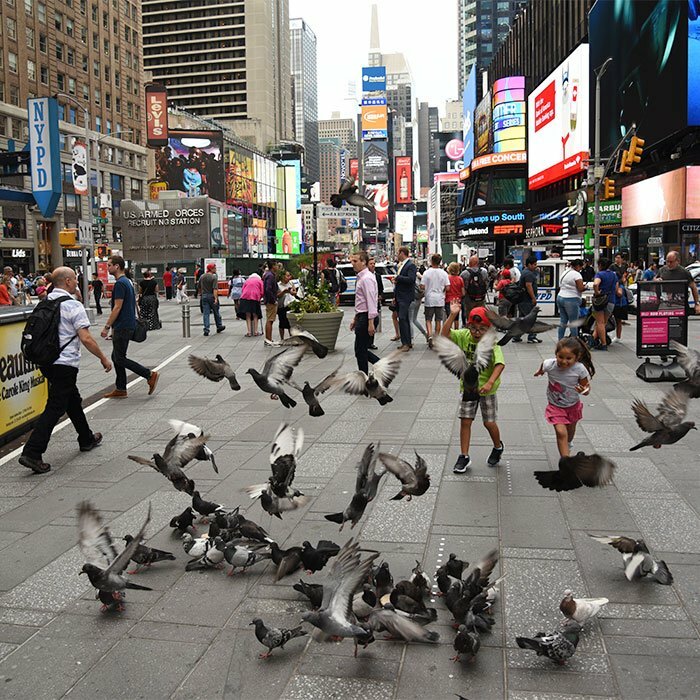 In 2009, Mayor Michael R. Bloomberg’s administration began prohibiting automobile traffic on several blocks along Broadway, providing spaces to sit, stroll, and gather instead. 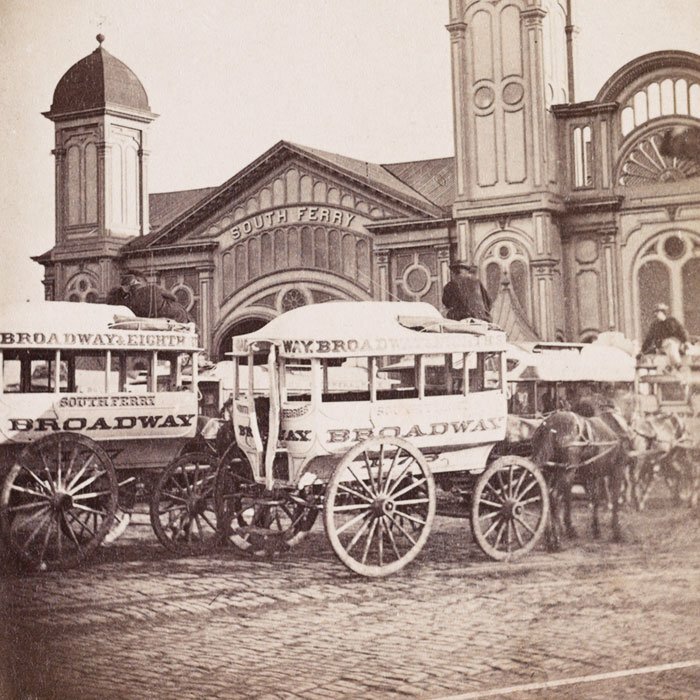 Several blocks along Broadway are havens for pedestrians where taxis, busses, motorcycles – and even omnibuses and horses – used to jockey for position. In doing so, Broadway has become a model for the growing “complete streets” movement, whereby streets are no longer the exclusive domain of cars but are designed to be safe for all users and all types of transit. 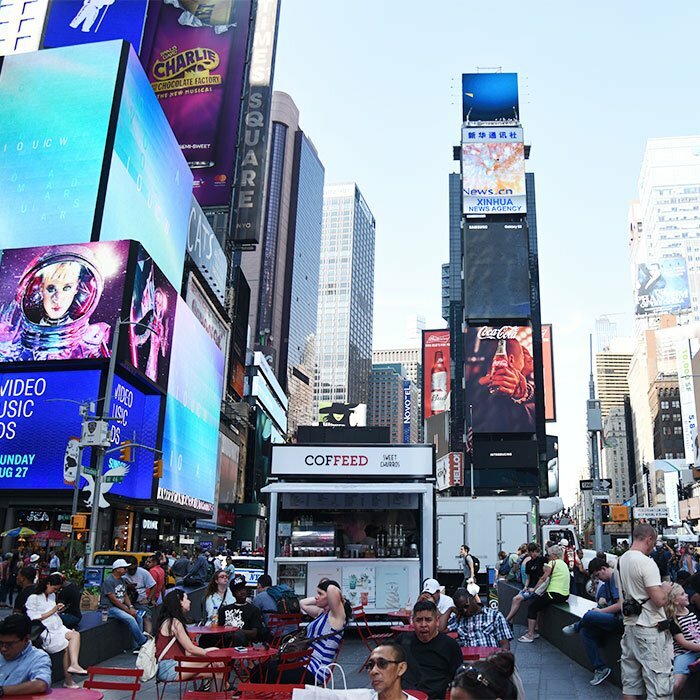 It represents a new stage in Broadway’s constant evolution, one that provides a radical new vision not only for New York but for cities everywhere.